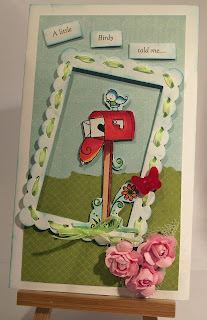 today is the start of the new challenge over at the Crafty Bloggers Network and the theme is 'Happy Bird-day! '. Here is my DT card for the challenge. The image, stamped in black ink, was coloured using my Copic markers. The image was then cut out and adhered to the blue /green backing created with the backing papers. I made the frame from a Nellie Snellen die and carefully cut the centre out to make the frame. Some thin green organza ribbon was threaded around the frame and tied in a bow at the bottom. 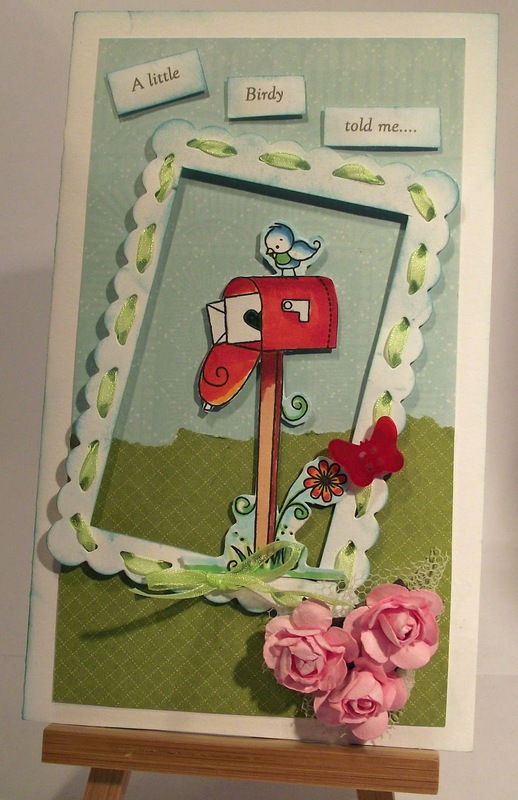 The card was finished with three pink paper fowers and a butterfly button as embellishments and teh sentiment was printed with my PC abd added to the top of the card. There are lots of ideas and inspiration over at the Crafty Bloggers Network so pop over and take a peek and maybe join in. Thanks for stopping by and reading by blog. Your time and comments are much appreciated. Nellie Snellen scalloped frame die. Lovely card, I really like the image. this is so cute :) Great card! So different and cool..The bending of frame adds a lot change!